Changes proposed for Gravois Avenue include reducing some lanes for vehicles while adding lanes for bikes, as well as upgrading lighting and signals. A Missouri Department of Transportation plan would reduce the roughly 1.5-mile stretch of Gravois between Christy Boulevard and Chippewa Street from four lanes to three. It also would shrink the half-mile portion of the road between Jefferson Avenue and near Interstate 55 from six to five lanes. MoDOT said its studies of Gravois, where 17,000 to 20,000 vehicles travel a day, show fewer lanes will lower traffic speeds and increase accessibility for cyclists and pedestrians. A plan last year had included shutting off access to the road from some side streets. But that idea was fiercely opposed by many residents and businesses, some of whom voiced their disapproval at a meeting last spring that grew tense. 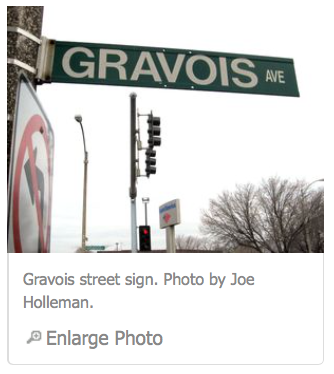 Because Gravois is a diagonal road that cuts through the standard street grid, side streets often enter Gravois within 50 feet of each other. That means that at intersections with signals, there are six legs of traffic at one intersection instead of the normal four. But street closures must be approved by the city’s Board of Aldermen, which didn’t happen — so no streets are closing. MoDOT detailed its new plans at a public meeting Tuesday. The agency is responsible for signals, signs, striping, sweeping and pavement maintenance on Gravois, which is part of Highway 30. Its plan for a $9 million project on the well-used road includes upgrading lighting and signals at the intersections of Morganford Road, Arsenal Street, Chippewa Street, Kingshighway, Cherokee Street/Tennessee Avenue, Utah Street/Louisiana Avenue, Compton Avenue/Wyoming Street, Ohio Avenue/Lynch Street, California Avenue, Shenandoah Avenue/McNair Avenue, Russell Boulevard and 12th Street/Geyer Avenue. Signal upgrades include pedestrian countdown indications and push buttons, and better syncing. And MoDOT will repair the pavement and resurface Gravois from just south of River Des Peres Boulevard to the area near Interstate 55. MoDOT also wants to add dedicated bike lanes in both directions from Christy to near Interstate 55 except for the stretch between Chippewa and Grand Boulevard, where bikes and vehicles would share the lanes. The agency said another option would be not to add bike lanes — although doing that would “not address safety improvements” or accessibility for bicycles or pedestrians. “As long as the bicyclists follow the rules and stop at stop signs and stop lights, it’s fine,” said Cara Watters, who has lived in Fox Park for more than 20 years. She was happy no side streets would be cut off, as was Andy Bender. He works for Jefferson Tent and Awning Co., which has been at the corner of Gravois, Arsenal Street and Pennsylvania Avenue since 1911. “It’s not the fiasco they had originally planned,” he said of the new proposal. Pennsylvania had been in danger of being closed under the first draft of the plan, which Bender said would have hampered customer and delivery access. Jeff Bohler, the project manager, said MoDOT is seeking to finalize its plans in the next couple of months. Comments are being taken for another two weeks. MoDOT hopes to award the project to a contractor in June, with construction beginning in the summer and wrapping up in late summer of next year.